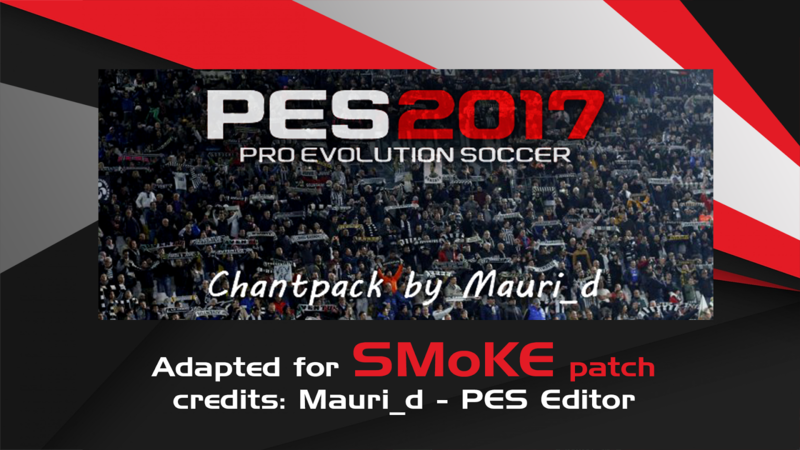 this is a chants pack created and made compatible with smoke patch 2017 by (Mauri_d - PES Editor), the chants are a great addition to the patch similar to smoke chants used in smoke patch for PES 2013. - SERIE A: ACF Fiorentina - AC MIlan - AS Roma - FC Internazionale Milano - Juventus FC - SSC Napoli. it is possible to use another extra cpk slot. click, wait 5 seconds then skip. Dido! I'm Paul_Stone341 can you please post my tatoo pack because there are a lot of people taht want this! No way. Haha...this looks pretty cool. I haven't used chant mods for years in PES. I'll give it a try. Hey when will I can play with Chinese Super League? because I installed the new update but there isn't? I can put the add for previous version? Is the chant already included in latest patch (9.3.3) or i have to do it manuaaly? I checked this out. Works great! The volume is perfect and the sound blends in nicely with the game. It doesn't feel out of place like it did the last time I tried a chant mod. Great Work! thanks for FC Zenit chants! cant download , 404 not found! tengo instalado la liga china 9.3.3 q es reemplazando el archivo smk8 como hago para poner estos canticos remplazo el mismo archivo o no puedo combinar la liga china con estos canticos ?? great job !!! but pllleeaasseeee for the next pack, can you put saint etienne chants ! ligue 1 (the best public in france !) thanks a lot! Anyway of being able to get this to work with PES 2018 Dido?